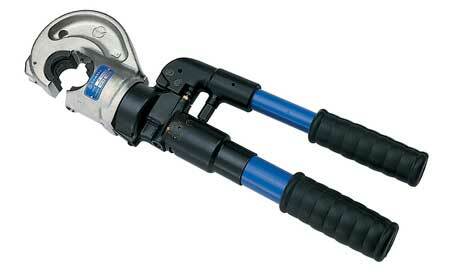 T&D are Preferred Distributors for the Cembre range of cable crimping tools. Cembre crimping tools are always the first choice of the electrical contractor, overhead linesman and cable jointer for ease of use, reliability and versatility - this includes Cembre hydraulic, ratchet and battery crimping tools. Ratchet, hydraulic and batter crimping tools for copper and aluminium cable connections, including MV-HV (11kV-33kV). Cembre HT131C - "The Industry Standard Crimping Tool"
Cembre HT131C hydraulic crimping tools are used for the crimping of all low and high voltage cable lugs and connectors up to 400sqmm. Hydraulic crimping tools utilise all semi-circular slotted die sets, common to most 130 kN tools. The Cembre HT131C crimping tool head can be rotated fully through 180 degrees for ease of crimping, jointing and terminating LV-HV cables. Cembre Mechanical Crimping Tools - ratchet and mechanical hand crimping tools to suit smaller cable sizes, vinyl-insulated and cord end terminals. Cembre Hydraulic Crimping Tools - for use with various crimping die sets for LV cables, HV cables and c-tap connectors. 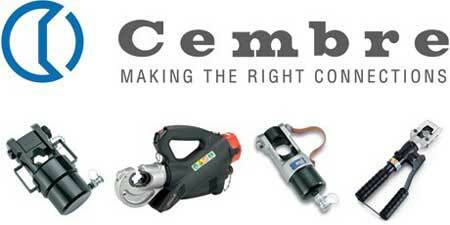 Cembre hydraulic crimping hand-tools offer ease of portability and are rugged and compact in use. Cembre Hydraulic Crimping Heads - crimp heads available with die sets for use upto 1200sqmm. Cembre hydraulic crimping heads can be used with various power units (Cembre PO7000 footpump or Cembre B70M-P24 battery powered pump). Crimp tool heads are available with removable die-holders when installing cable splices during cable jointing. Cembre Battery Operated Crimp Tooling - Cembre battery-operated range incorporates crimping tools which accept die sets up to 185sqmm (Cembre B51) and 400sqmm (Cembre B131-C & Cembre B131-UC).